Rosacea is a common inflammatory dermatologic condition that affects the midface and eyes. [1, 2, 3, 4] Although the etiology of rosacea is not fully understood, an augmented response of the innate immune system and neurovascular pathways to certain triggers are considered to be major factors in the chronic inflammatory process associated with this condition. The nose, cheeks, forehead, chin, and glabella are the most commonly affected areas. Clinical features include flushing, telangiectasias, erythema, papules and pustules, and rhinophyma. 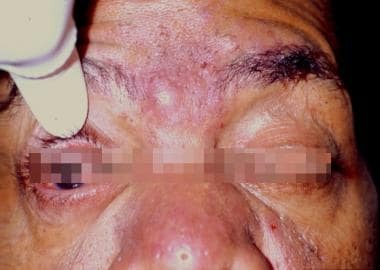 More than 50% of patients with rosacea have ocular manifestations, and ocular findings may be the first manifestation of rosacea in some patients. Ocular rosacea is most frequently diagnosed when patients also suffer from cutaneous disease. However, ocular signs and symptoms may occur prior to cutaneous manifestations in 20% of patients with rosacea. No correlation exists between the severity of ocular disease and the severity of facial rosacea. The symptoms of rosacea can be treated effectively; however, rosacea is a chronic condition with exacerbations and remissions, which requires long-term therapy to maintain symptomatic control. A variety of rosacea triggers have been described including skin colonization with Demodex mites (along with bacteria in their gut)  and Staphylococcus epidermidis. Eradication of Helicobacter pylori has been shown to improve rosacea in some patients, and the organism may play a role in the pathogenesis of inflammation of inflammation in rosacea. Four distinct rosacea subtypes have been described: erythematotelangiectatic rosacea, papulopustular rosacea, phymatous rosacea, and ocular rosacea. More than 10% of the general population exhibits dermatologic characteristics of rosacea; of these, up to 60% experience ocular complications. While rosacea is not a life-threatening disease, it is a source of much morbidity because of pruritus, burning, and psychosocial impairments. Approximately 5% of patients with rosacea manifest corneal disease, which can rarely be severe and lead to blindness via corneal ulceration, perforation, secondary infections, or corneal opacification from complete vascularization. Rosacea is recognized much more commonly in fair-skinned, white patients than in dark-skinned patients. However, because dark skin tones may mask erythema of rosacea, its incidence in this population is likely underreported. Women are affected with the papulopustular and erythematotelangiectatic rosacea subtypes twice as often as men; however, the phymatous rosacea subtype develops much more frequently in men. Ocular rosacea affects both sexes equally. All ages can be affected, including pediatric patients. Peak incidence occurs in the fourth to seventh decades. Young children with chalazion may have ocular rosacea but may be uncooperative for slit-lamp examination. Rosacea can be controlled symptomatically but is generally a chronic condition, which requires long-term, follow-up care. Informing patients of the chronic, relapsing nature of rosacea is important so that patient expectation matches available therapy and patient follow-up care is maximized. Ophthalmologists may underdiagnose rosacea because of a lack of familiarity with the dermatologic manifestations of the disease.